What are 'gains'? 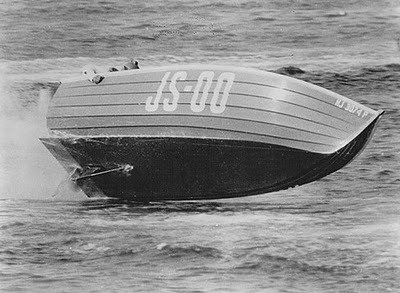 On a lapstrake boat, like the one below, the planks overlap for the full length of the boat, but overlap magically disappears at the stem (and sometimes at the transom). There are several ways to perform this disappearing lap trick. I chose the method that looked the simplest to me: cutting a sloping rabbet or gain along the edge of each plank. Luckily, I had picked up an old Stanley rabbet plane at a flea market over the summer. This No. 78 plane has guides for both the width and depth of the rabbet, but because the plank was already fastened to the frame, the guides were in the way. I unscrewed them, tuned up the blade, and got to work. Of course, I couldn't cut a straight, sloping gain without some sort of guide, so I clamped this bit of plywood along the lap line (for a 3/4" overlap). Then it was fairly simple to cut a slopping gain, about 12" long. Here's a shot that shows the basic idea... You just run the rabbet plane along the guide. To make the gain slope, you just make more passes at the end. I did it all by eye... I'm not sure how to cut this slope more scientifically, but since the plywood was only 1/4" thick, we are not talking about a deep gain. Speaking of depth, to make the lap totally disappear, you need to cut the gain so the end is paper thin. This end is backed up by the transom or stem, but I didn't have that kind of nerve. I left some thickness at the end of the gain and plan to cut a corresponding gain in the overlapping plank, so neither plank is too think on the edge. Of course, you need to cut a gain on both ends of the plank. I started with the easy one at the transom. 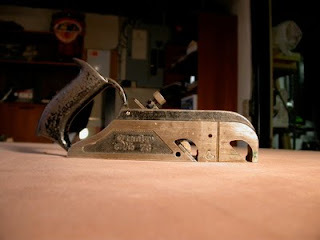 The one at the stem was twice as hard to cut, because the plank twists into the stem, and the stem gets in the way of the plane, and stops you from cutting the gain all the way to the end, even if you move the blade to the front of the plane, as the Stanley No. 78 allows. In fact, it was such a pain to cut the gains near the stem that I totally forgot to take any pictures. Suffice to say that I cut as much as possible with the plane, and then finished the job with a chisel. Too bad, because it would have been a classic "How-Not-To" tutorial! 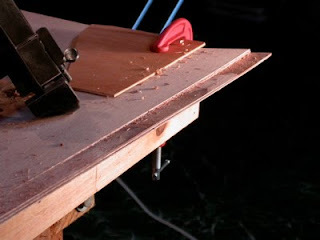 If you are not a complete blockhead who fastens the plank to the forms before cutting the gains, you can do it the right way, as I did on the port-side garboard plank. 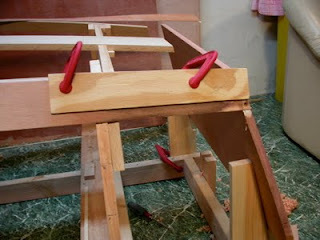 This is the right way to do the job... firmly clamp the plank to your bench and plane away. You can even use the width and depth guides, which I've re-attached, above. This gives you a nice, clean, sloping gain in about 1/8th the time. Wow! Neither this photo, nor the plans of Cabin Boy really communicate the lovely curves that make up this small fraction of a boat. I'm not really sure how John Atkin did it... The sides of the forms are straight, but every part of the boat curves in an almost magical way. Particularly the garboard planks, which not only curve but twist at both ends. I must admit I had recently been wondering if all this work was worth it... There surely are easier boats to build, and easier methods to use. But for the first time I had a inkling of Cabin Boy's final shape, and I fell in love with the design, all over again. Yes, it is worth all the work. >>> Next Episode: Over the Hump? Gains? This boat has gains? he-he. OK, we get to laugh with you ... just once. Don't let us have another chance to laugh. There's another chance coming up and it's a classic. It happens way too often. It's actually very commonplace. Avoid it. Be disciplined. Deprive us of that opportunity. That problem, John, is the one of cutting the same gains (not mirror images) on the next pair of planks ... sort of like ending up with two left shoes. Lots of builders make the error sooner or later, and it always costs a plank of lumber, and a few choice words. Mark em well. Get out your chalk. Mark one plank "S" and the other "P." Draw out, with chalk, the inboard (lower) gains on each plank. Draw out, with chalk, the outboard (upper) gains on each plank. Double check at least 3 times, then check again every time you pick up the plane. Yep, boat lines sure are pretty. Thanks for the warning, Bob. You're right. As soon as I get clever enough to make both planks at the same time, I'm bound to make that mistake. At the moment, I'm still having to spile each plank twice before I manage to get it right. Man John, I commend you for biting this off. I think my first boat will either be the Sand Dollar - Arch Davis, or one of the pram kits that are fully cut. But the curves are fabulous. That is certainly what drew you to Blue Moon. I am an RV'er - but I am drawn to the simplicity of the "tent" side. "RABBET" not "rabbit", but otherwise an excellent piece! Bruce: thanks. About once a week I think 'wow... this is too complicated', but then I figure out whatever problem is blocking me, and it turns out the solution is pretty cool... I can see why some people build boat after boat. Rabbet vs rabbit: At least I was consistent this time. I have a mental block when it comes to spelling this word. Another tip for those still shopping for a rabbet plane. Look for simpler planes such as the Stanley #75, #90, #90A or #92. The #78 filletster plane that John uses is OK, but maybe too complex for the task. He jettisoned the guides for this on-the-boat cut and will probably leave them off when doing the next series of gains. 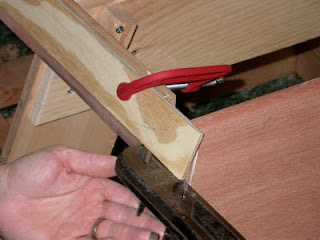 The problem with the filletster is that it was intended for a cabinetmaking task, not an inclined rabbet task. The simpler rabbet planes make this particular task (and most boat building rabbets) a bit easier. 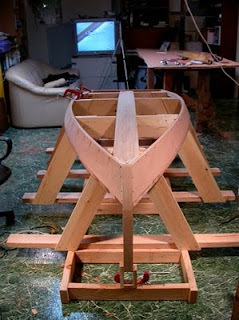 rabbit vs rabbet...or rebate if you learned your boatbuilding on the other side of the Atlantic. These comments are moderated, so don't bother posting any more spam. It will not be posted.